When induction is properly implemented into a process, you can count on the same result every time. A torch sometimes leads to inconsistent results and uneven heating, and the end product is only as good as the operator – if the operator moves on, quality issues may ensue. Induction typically heats parts to temperature more rapidly than a torch, generating a superior production rate. There is no open flame with induction, resulting in enhanced workplace safety. Additionally, it introduces less heat into the working environment, creating a better environment for workers. 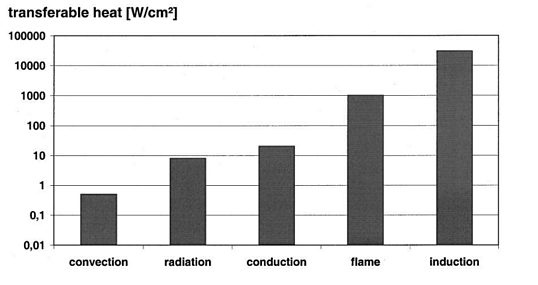 The picture above compares induction heating with other heat sources. More transferable heat means that the energy is used and transferred in a localized, precise manner. Induction heating is clearly superior over other heating methods often applied in a production process. So, in a nutshell, the benefits of induction are a production-boosting speed of heating, less footprint due to a reduced energy use and enhanced workplace safety. In short, induction helps you become cleaner and greener. Now, induction heating's optimal use and application depends largely on expert advise. Are you considering switching from torch or furnace heating to induction? Read about our exceptional lab testing service. Are you interested in learning more about the features of this remarkable heating technology? Take a look at our rich video library and see induction heating in action!